Welcome! The following map is an overview of this guide. Academics have a long history of claiming and defending the superiority of verbal over visual for representing knowledge ... however, in the last decade, digital technologies have broken down the barriers between words and pictures, and many of these same academics are now willing to acknowledge that melding text with image constructs new meaning." Metros adds that in a freshman class she taught, "although these students were indeed visual learners and traveled seamlessly in a world rich with sight (and sound), they lacked the ability to express themselves visually." Today's society is highly visual, and visual imagery is no longer supplemental to other forms of information. New digital technologies have made it possible for almost anyone to create and share visual media. Yet the pervasiveness of images and visual media does not necessarily mean that individuals are able to critically view, use, and produce visual content. Individuals must develop these essential skills in order to engage capably in a visually-oriented society. There are many ways of looking at visual literacy. Definitions from educators, designers, photographers, video editors and producers are likely to reflect their own somewhat differing perspectives. One approach to defining literacies is to identify a set of skills, or standards. A broad set of Visual Literacy Competency Standards for for Higher Education provided by the Association of College and Research Libraries (ACRL) encompasses many aspects of visual literacy. 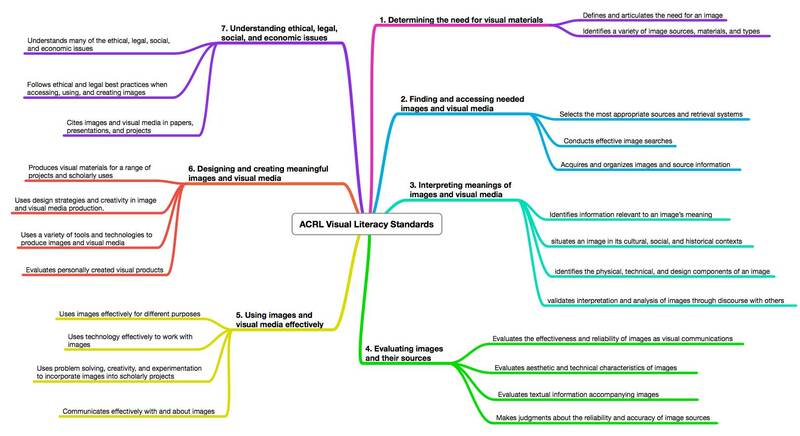 Here is a visual map of the ACRL visual literacy standards (opens in a new window). The map is also included the References section of this guide. <* See the Resources section for a much more extensive list of important resources about many aspects of visual literacy. The ability to produce meaningful images for communication to others. 1. 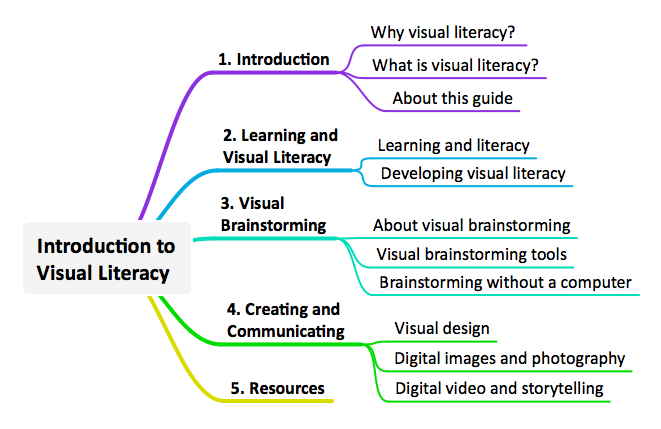 Introduction (what you are reading now) introduces the subject of visual literacy and why it is important, and presents an overview of this guide. 2. Learning and Visual Literacy looks at the relationships betweeen literacy, learning, and visual awareness. This helps us understand, critique, and learn from visual information. 3. Visual Brainstorming is about creating something new. Visual brainstorming is a way of working with ideas visually and integrating them into new structures. 5. Resouces and Links provides resources used in preparing this guide, as well as many additional resources and links, organized by topic. The guide follows a general sequence that reflects a creative process: first experiencing and learning from images or others, then using visual thinking to develop new ideas, and finally using tools to create and communicate. Some topics are likely to be more relevant to your needs than others. For example, visual brainstorming is unlikely to be necessary before doing a photo shoot (although in some cases it may be useful!). Use whatever is most relevant to you.